So much for a milder winter to make up for last years deep freeze. True, it is not as bad as last year. We have been able to practice a few times for the upcoming season, but the last few weeks have made up for the slow start to winter with temperatures as low as -20 F in the morning. Sure, we do not have it as bad as my Canadian friends or those from Minnesota. But, I have had it. See what I mean? I am thinking of moving to the Carolinas. Or, maybe we will win the Powerball and buy a small Caribbean island? Well, neither of those options are going to happen any time soon. So, in order to cope, it was time to come with with some meals to warm you up. 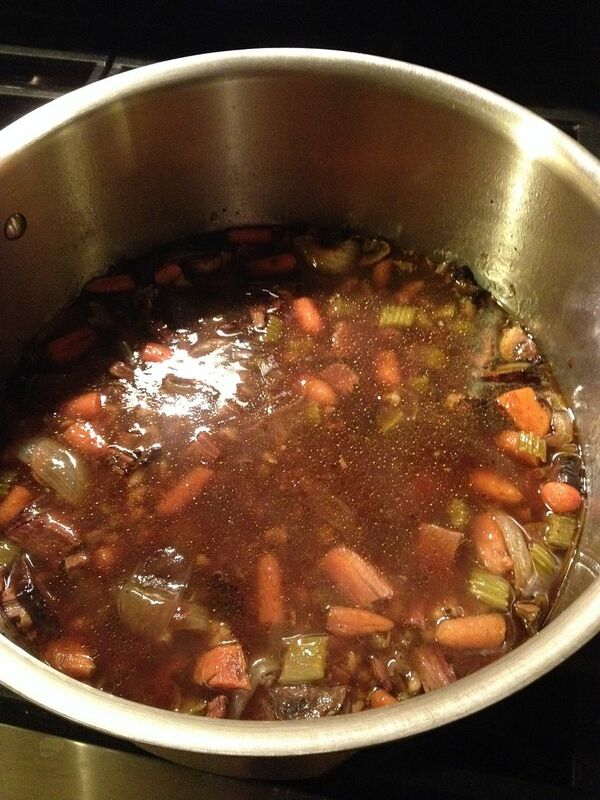 A friend of ours from the BBQ circuit, John from Eatapedia, posted a nice recipe making beef stew from leftover brisket. Then, a colleague from work took a brisket I smoked for him and turned it into a tomato based brisket barley chili. I just happened to have some leftover brisket from a recent practice. I had some leftover point (the fatty juicy end) and some leftover flat (the lean end that some of you may equate with pastrami or smoked brisket slices). So, with my leftovers, I took my two inspirations and combined them into one. I give you Brisket Barley Soup with Wild Rice and Roasted Veggies. 1 lb of smoked brisket, chunked. I used a mix of point and flat. Either will work fine. 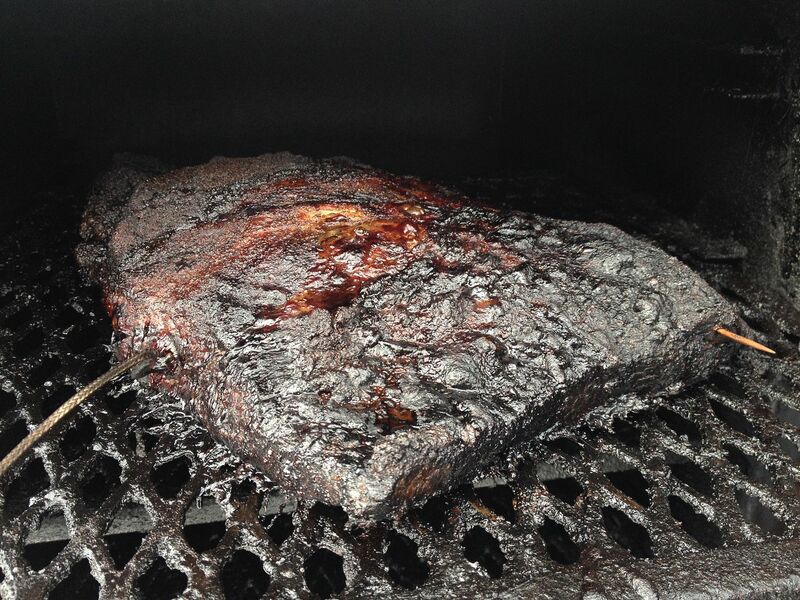 Don't have any smoked brisket? Stew meat will work. Just cube to the size you want and cook while simmering for at least 12 minutes. Longer if you want your beef more tender. I bought the uncooked, whole grain barley. Why? Of all things the store was out of that day. 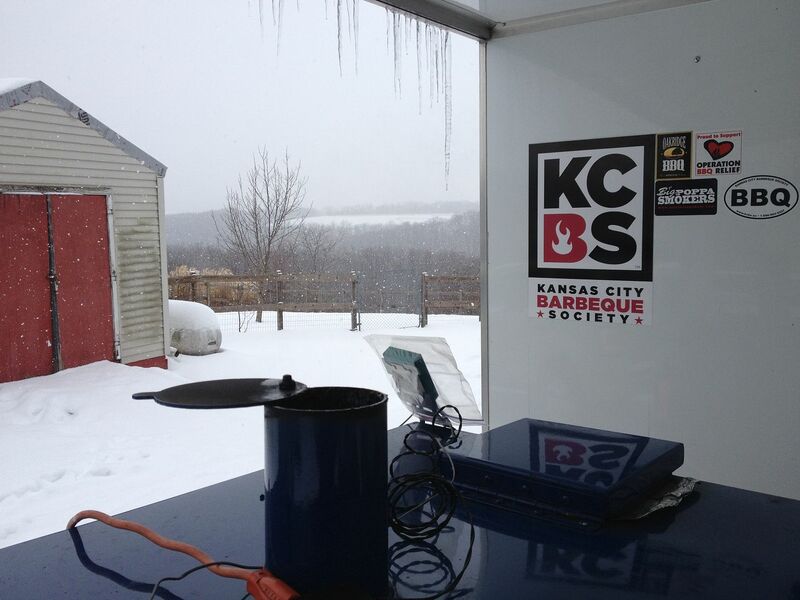 Everyone must have had vegetable soup on their mind that weekend with the impending winter storm. There was a run on milk, bread, toilet paper, and quick barley. You can never have enough of either during a winter emergency. Right. Anyway, I rinsed 1/2 cup of the barley and cooked according to the package instructions. Barley expands four times during the cooking process, so I ended up with two cups. 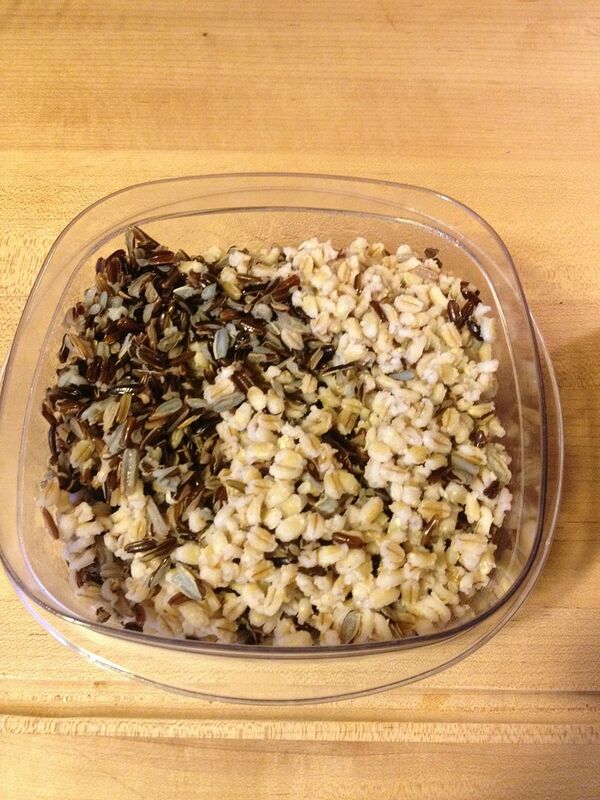 Next, I cooked the wild rice, a last second addition to this recipe. Why? Because it was next to the empty row of quick barley. After cooking, I cooled and placed in the refrigerator for use the next day. 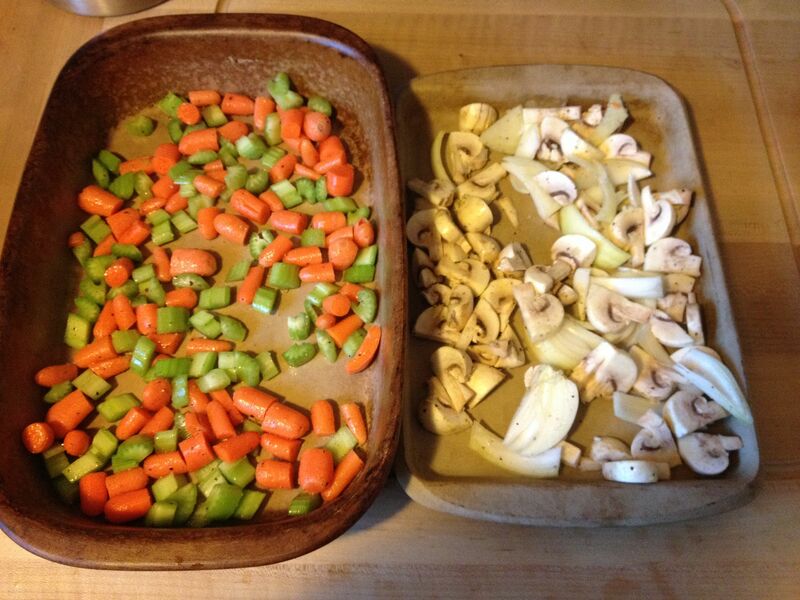 The next day, I roasted my carrots and celery in one pan and my mushrooms and onions in another. I used about 2 tsp olive oil to coat each and added salt and pepper to taste. 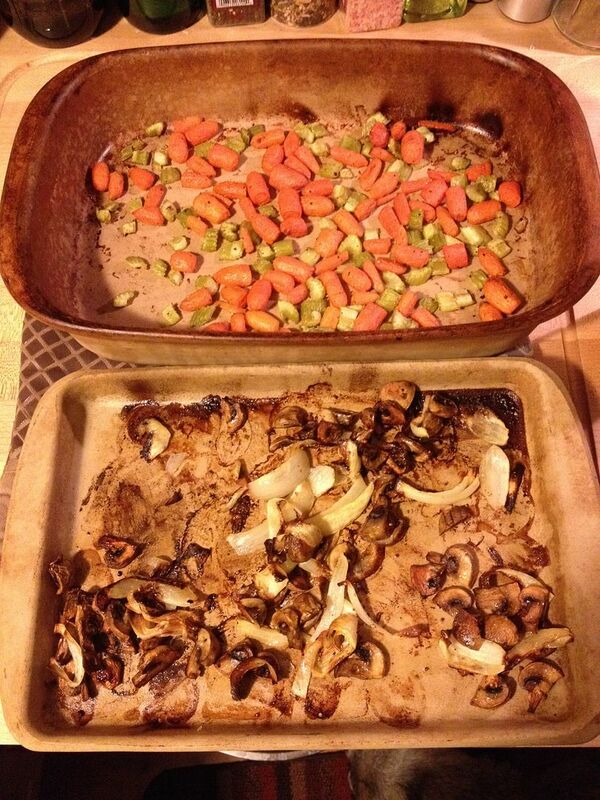 The carrot/celery mixture was roasted in the oven at 400 F for one hour and the mushroom/onion mixture was roasted at 350 F for one hour. Here is the before and after. While the veggies and fungi were roasting, I placed my beef broth in dutch oven and brought to a boil, added my chunked brisket, and lowered the heat to a simmer. Here is the chucked brisket for an idea on size. I went with the larger sized chunks knowing that during the simmer time with the broth, the chunks would break down into medium sized pieces of brisket. I didn't want strained baby food consistency. So, when the veggies were done and after about 30 minutes of the simmering beef and broth, I added my veggies, fungi, and barley/rice mixture. I brought the mixture back to a simmer and let it cook for 30 more minutes. Not the best final picture I have taken, but you get the idea. The veggies and mushrooms contributed a nice caramelized component to this soup. The barley and rice added some texture. 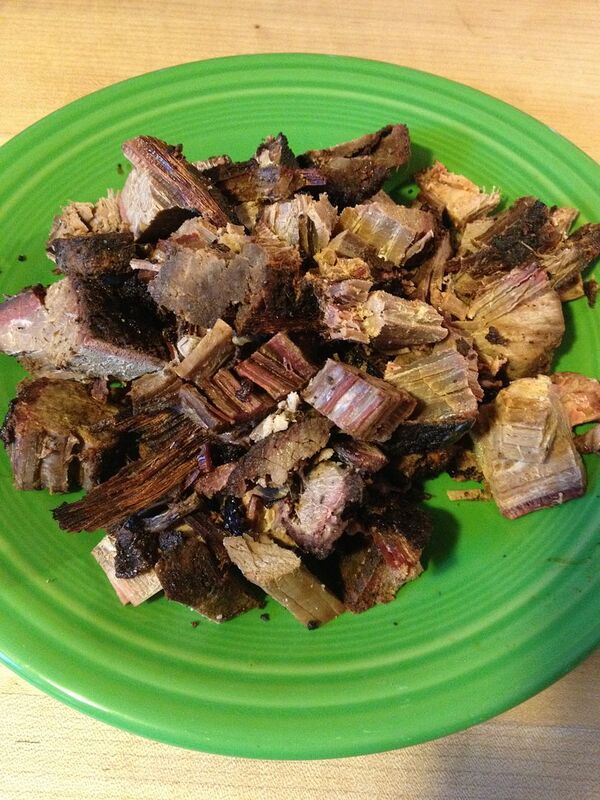 As for the brisket, the bark from the Oakridge Black Ops brisket rub flavored the broth perfectly. There was even that slight smokey taste that comes with a smoked brisket. A perfect hearty soup for a cold winter day. That is a hearty soup that would satisfy. Smoke brisket is like bacon, it goes good with everything. I hadn't thought of it that way Chilebrown. Now that you mention it, you are right.